My love for smoothie is a continuing saga. Yes I love it and make it very often. Whether I cook or bake, smoothie is made in my kitchen every other day. And I am always looking for new ways to make smoothies. For me smoothies should contain fresh fruit and veggies and also have other good ingredients like accai, goji, chia seeds, etc. 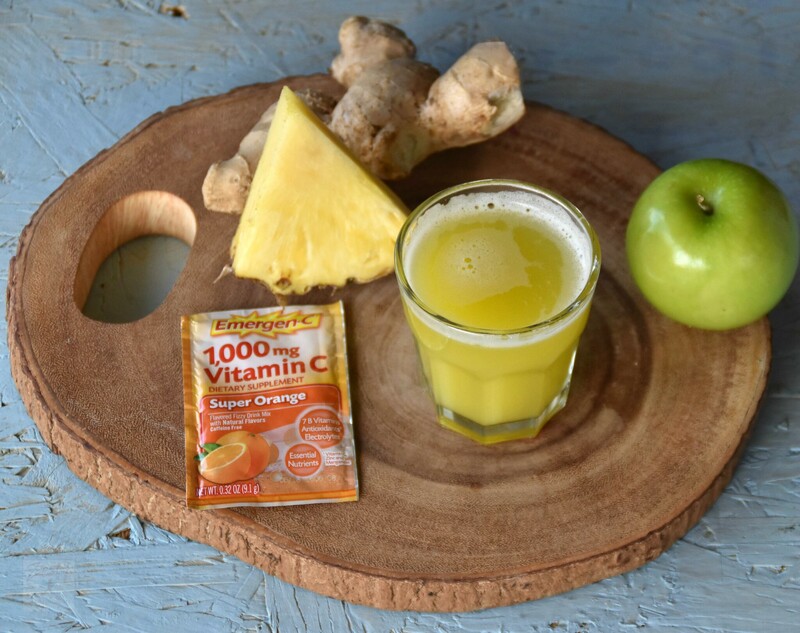 So decide to make this Apple pineapple ginger Emergen-C Smoothie as it has Emergen-C. In my house Granny smith apple and pineapple is always there in my fruit basket as it gets over without any problem. Earlier I made a drink using fresh orange, garlic and chili pepper now that I got a chance to use Emergen-C I decided to put it in this smoothie as I like the fizz and taste. 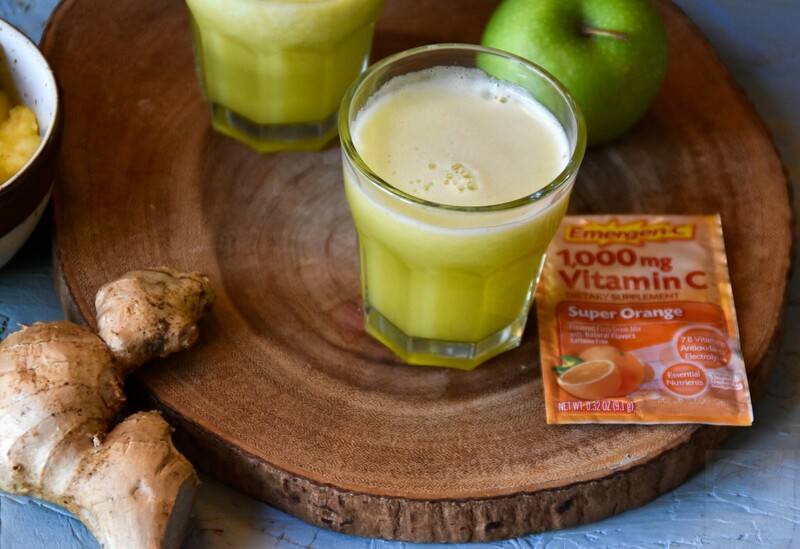 Since we liked the taste, I am going to include Emergen-C in some of smoothies that I make during the winter months because of the vitamin C that it has. You can buy Emergen-C from you local Walgreen stores. For me a food or drink should have, taste, flavor and should look appealing. Tart flavor is given by the granny smith apple and nothing can match that along with extra nutritional benefits you get! Apples can help you reduce your cholesterol and may help reduce the risk of heart disease. Plus they give you energy. Pineapple is my favorite tropical fruit and makes everything exotic. It is also a storehouse of huge health benefits due to its wealth of nutrients, vitamins, and minerals, as well as soluble and insoluble fiber. The zing which ginger adds is unmatchable. Yes I like to add them not only in my curries but also smoothies. Especially during the Fall I like to use ginger more. 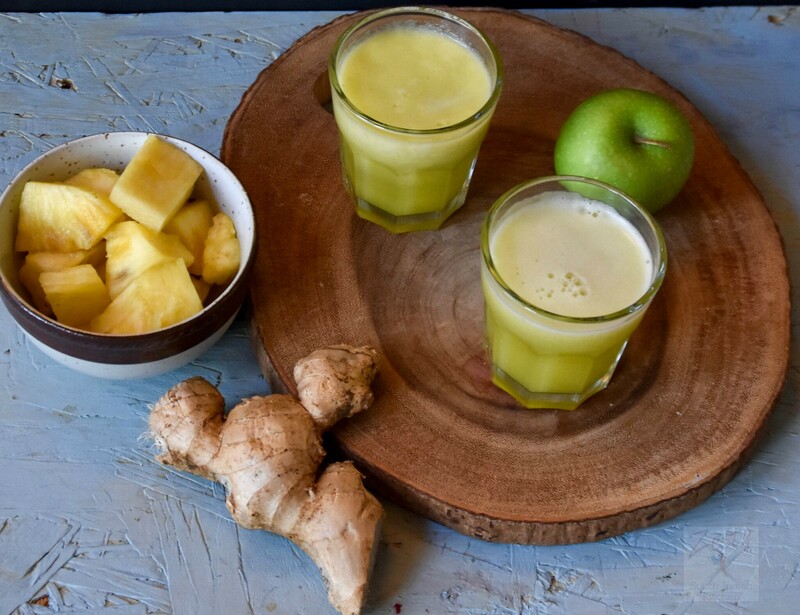 Whether it is dessert like gingerbread or cookie, fresh ginger make a difference. I still remember that my dad used to buy us ginger candy whenever we went on a long trip by bus or car. According to him it prevents nausea and vomiting and is a natural medicine. My new found love is Emergen-C which has 7 B Vitamins which enhance energy naturally* without caffeine in my smoothie. 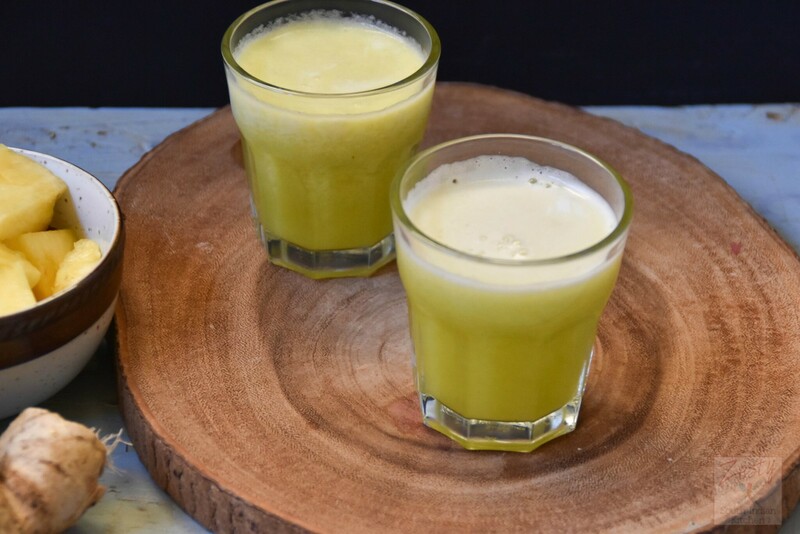 With over 20 flavors, you have plenty of delicious varieties to choose from and it has about 1,000 mg of Vitamin C plus other antioxidants Zinc and Manganese support your immune system* If you are looking for a refreshing drink during these cold winter time or any time of year try this smoothie. Are you ready to whip up some delicious refreshing smoothie then grab following ingredients. 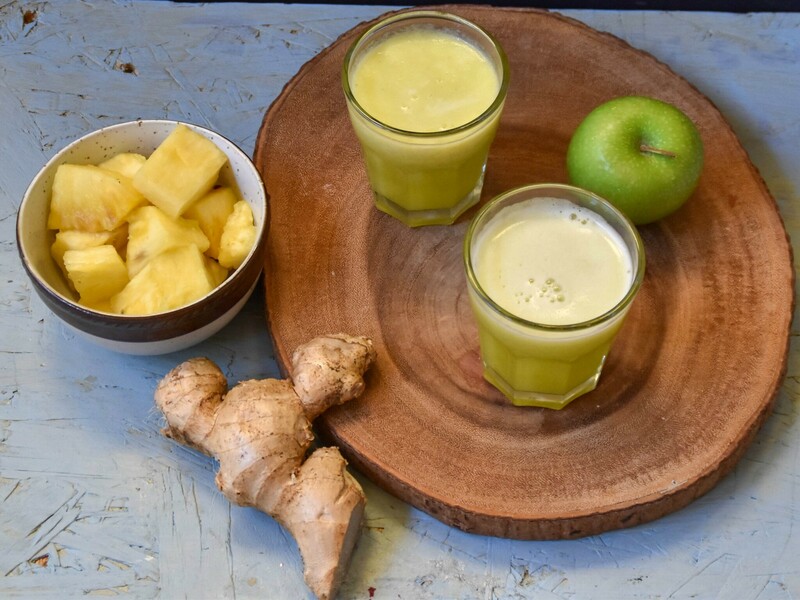 Delicious refreshing smoothie made with fresh apple, pineapple, ginger and Emergen-C. I love apple and pineapple smoothie. And I loved that you added ginger. I bet the ginger will add extra flavor to the smoothie. Pinning and tweeting!! Looks perfect ! Healthy and refreshing ! Love the way you presented it ! Really interesting idea to incorporating emergen-c into a smoothie. I usually just take it with water when I start feeling like I’m getting stick.